With Zendesk Talk, you can choose between using your web browser or your phone to place and receive calls. Before you start, ensure that you are using a web browser (like Google Chrome or Firefox) that supports WebRTC (Web Real-Time Communication), a browser-based communication protocol to make calls. Zendesk Talk does not work with Adobe Flash. Tip: Factors such as the speed and reliability of your network, your network security, and the type of headsets you use can all affect the quality of Talk calls. Additionally, if you use a browser to place and receive calls, you must open ports on your computer and network firewalls for Zendesk Talk to work. To learn more, see Preparing for Zendesk Talk. Click the Talk icon ( ) in the top toolbar to open the call console. In the call console, click the globe icon and then select Via Browser. As well as placing and receiving calls using a web browser, you can forward calls to another phone such as your office, or mobile phone. Note: When you forward calls to another phone, the caller ID will display your Zendesk Talk number as the caller ID, not the original caller's phone number. In Zendesk Support, click your profile photo at the top-right of the console, and then click View profile. In the Talk Agent section of your profile, make sure that Talk Agent is turned on. Next to Agent forwarding, click + add number. In the window that appears, select a country and enter your phone number. If your telephone number includes an extension, add it to the extension field. If you also use additional key presses, you can also add those to the extension field. For example, if a caller must dial '123' followed by a pound ('#') key, enter '123#'. Note: If multiple users will share the same forwarding number, you must include different extension numbers for each agent. In the call console, click the globe icon and select Via Phone. Important: If you have a personal voicemail account on your phone, configure the Talk setting Agent confirmation when forwarding. This requires you to press a key before the call is connected to indicate that a human is answering the call instead of voicemail. If a key is not pressed, the call is routed to Talk's voicemail. For details, see Enabling Zendesk Talk and configuring general settings. I recommend voting on the relevant requests and adding your use case in the comments. Do you know which browser they are using? Several people reported seeing this issue on Chrome last week due to an audio update pushed by Google. 2) Change it to "No user gesture is required"
You can also read through that conversation for more details. Let us know if that fixes it for you! We are using an external Toll free number (not zendesk number) for all incoming calls on our zendesk number. Now we are getting the same Caller id number ( the external toll free number) for every incoming call on zendesk. How can we enable the originating caller id number? The forwarding of caller ID information to Zendesk Talk numbers is definitely possible, but from what you're describing the best recommendation here is to have the you check with the external service provider that provides the original access number to see whether the original caller ID information can be passed when forwarding that phone number to your Zendesk Talk number. I do hope that helps, Malik! We have tested this with the external service and yes its passing the original caller id information. 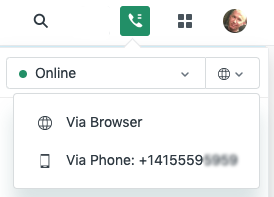 While signed into Zendesk on my computer (chrome), my team longer receives "an incoming call" alert. It does not provide the alert for incoming calls whether calling our company support line OR our Zendesk assigned number. but I can see the missed calls in our "call history" admin panel. It worked last month and mysteriously stopped working this month. Your Zendesk support team has not been able to determine the issue. Our customer service is failing because we no longer know when customers are calling in :-( PLEASE HELP!! Do you already have a ticket open with our support agents? If so, can you tell me what the ticket number is so I can check on it? When inbound call comes in, how can i make it ring on the speakers? But when I accept the call the inbound call sound comes into the headset. Are there any WebRTC Chrome extensions that can be used to accomplish this? Does Zendesk Talk have similar WebRTC extension that has this option that can be used in Chrome or Firefox? This is a great question, and I can certainly see the validity of the request. Unfortunately this is something that is not planned at this time. We have a similar request over on our Talk Product Feedback Forum that you can check out here, with direct interaction from a Talk Product Manager explaining the reasoning.